In my day job, my colleagues are vaguely aware of me as a running fanatic, and so they’ll occasionally draw me into a conversation or ask for my opinion about some running-related matter. For instance, after ‘Born to Run‘ came out, I got lots of questions about barefoot running. More recently, I’ve been asked about the likelihood of someone running a sub two-hour marathon, about the benefits of being born at altitude, and the efficacy of five-minute workouts. It’s fun to feel like an expert as I expound on recent research or pass along insights gleaned from my own experience as a runner and coach. I do my best not to be too insufferable as I see eyes glazing over. Uncharacteristically, I was at a loss for words. So here’s my attempt to answer that question — after the fact — about the significance of Farah’s new mark. It’s undoubtedly true that the two-mile is run infrequently at every level. For example, at the high school level, I’m pretty sure Massachusetts is the only state where athletes compete in the two-mile, with all the others opting for 3000m or 3200m. It is never run at the college level, and rarely run in professional meets. It is not an IAAF standard distance. So that kind of answers the question, right? Well, not exactly. While it’s true that it’s rarely run, when it IS contested at the pro level, it’s usually for the purpose of bringing together some very fast people, providing them with a first-class pacemaker, and encouraging them to go after a record. It’s plausible that the times produced by such attempts are on par with record attempts in more standard distances. So let’s compare the two-mile record to other distances. Is it a poor cousin, or a rightful member of the world record family? Let’s start by looking at the performances of Galen Rupp, who happens to hold the American Records in the indoor 3000m, 2M, and 5000m. How do those times compare with each other? According to IAAF scoring tables, Rupps 2M AR of 8:07.41 2M is equivalent to a 7:32.3 3000m or a 12:55.94 5000m. So 8:07.41 looks much better’s than Rupp’s 5k AR of 13:01.26, but not quite as good as his 3000m PR of 7:30.16. Verdict: Rupp’s 2M AR is pretty legit. Next, let’s look at the 3k, 2M, and 5k personal bests of Keninisa Bekele, who held the old 2M WR and still has the 5000m WR. Bekele ran 8:04.35 for 2M indoors, compared to 7:30.51 for 3k and 12:49.60 for 5000m. According to the IAAF tables, 8:04.35 for 2M is equivalent to a 7:29.46 for 3000m and a 12:51.08 for 5000m. So in this case, Bekele’s 2M compares favorably with his best 3000m, and is pretty much equal to his 5000m WR. Verdict: Bekele’s 2M was pretty legit, at least for him. But now let’s consider the current world records. 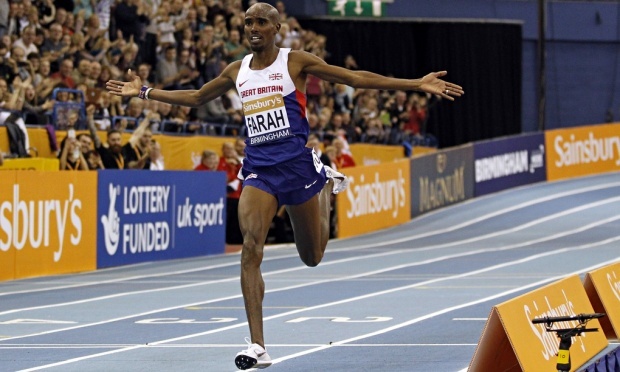 IAAF says that Farah’s 8:03.40 is equivalent to a 7:28.68 3000m and a 12:49.74 5k. So the new 2M WR and existing 5k WR line up almost perfectly. However, Daniel Komen’s 3K world record stands at 7:24.90, nearly four seconds better than the theoretical 7:28.68 that Farah’s 2M time produces. Moreover, Haile Gebrselassie ran under that time three times, and two other men — Yenew Alimirew and Augustine Choge ran 7:28.00 or better indoors. So the verdict here is that the number of opportunities to run the 3000m, and the likelihood of the best runners making record attempts in that distance, tilts in favor of the 3k. Nevertheless, in the context of indoor, Farah’s record is real enough. It’s not as though just any fast runner can organize a 2M and expect to come away with a WR. All of this reminds me that the REAL question about real records is whether indoor records are as real as outdoor records. I’ll have to postpone that discussion for another time, but it would be interesting to look at how indoor bests compare with outdoor bests, and why indoor might be slower than outdoor (or not) for a given individual or everyone. In any case, TheRunnerEclectic.com is willing to go on the record and officially endorse Mo’s new record as — in the immortal words of Steve Cram — fast! This entry was posted in Pro Runners, Records & Statistics and tagged 2-Mile, Mo Farah, world record. Bookmark the permalink.